The unfrosted light bulb overhead was swinging crazily on its loose wire, and the jumbled black shadows kept swirling and bobbing chaotically, so that the entire tent seemed to be reeling. Why is the light bulb "unfrosted"? I understand the meaning of "unfrost", but I don't understand how a light bulb can be unfrosted. Is this some metaphor? It means the light bulb that is "not frosted". Frosted glass is translucent(semi transparent). So it refers to a clear(transparent) glass bulb where you can see the filament. 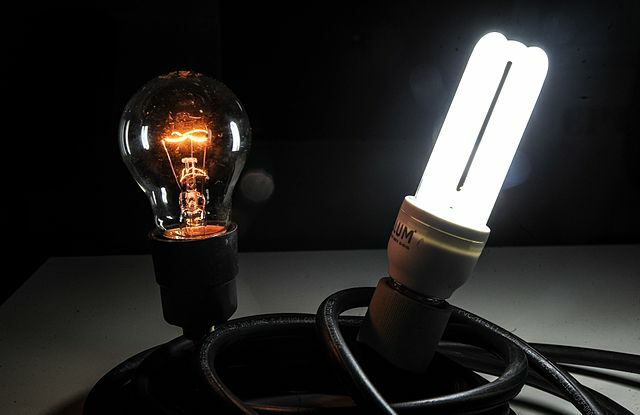 A frosted light bulb (l) is one with a translucent white coating sprayed on the interior surface which diffuses the light. 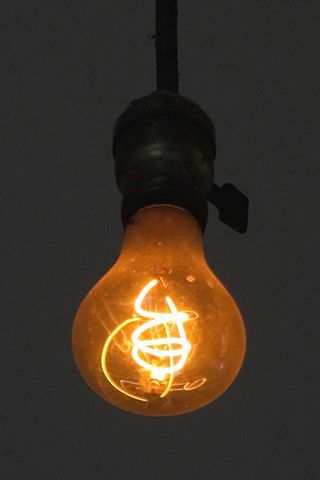 Earlier incandescent bulbs were all made of clear glass, i.e. unfrosted (r). Frosted bulbs came on the American market in the 1920s. Whilst we can agree about the literal meaning of frosted and unfrosted, the important part is what the significance would be in this context. We need to look at the properties of these bulbs. Both lampshades and frosting made the light less harsh by making the shadows more diffuse. A lampshade would have given the most pleasant light, at the cost of (1) the lampshade, and (2) reduced efficiency as some light would be absorbed, leading to higher running costs. 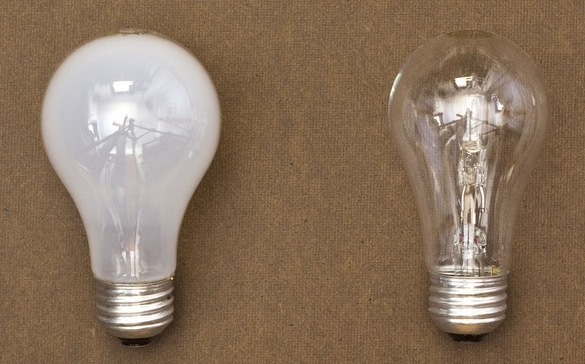 A frosted bulb would have had the same two effects, to a lesser extent. 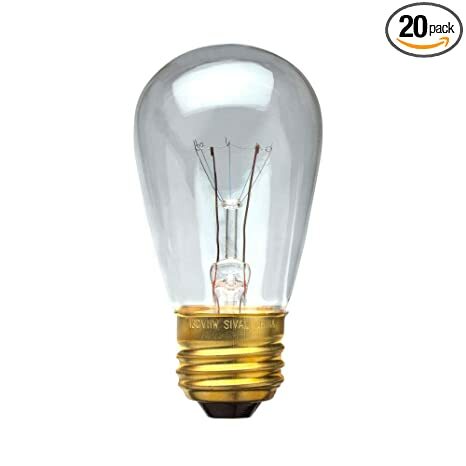 This bulb (which clearly had no shade as it was just on a wire) was therefore the cheapest option, in terms of both capital and running costs. So we get a sense of cheapness. But we also get a sense of atmosphere, as these moving shadows, caused by the swinging bulb would have been much more noticeable, detailed and distracting from this unshaded, unfrosted bulb. Even a small movement would lead to moving sharp patterns on the wall, that would not occur with a frosted bulb. Addition in response to comment: since the bulb is in a tent it is quite possible it is battery powered. This would accentuate the power-saving aspect. Further, a low-powered bulb is likely. This would have had a physically smaller filament and made the shadows even sharper. Since everything would be close together, it would be easy to see a lot of detail, even fingers and locks of hair in the moving shadows on the walls of the tent. 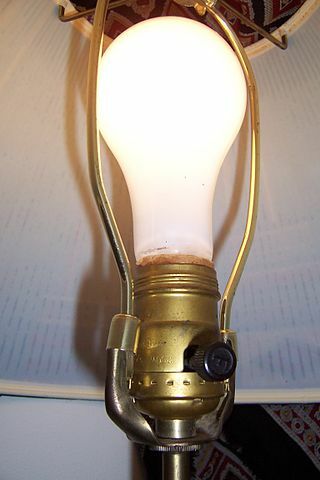 Though this an actually vintage bulb still going (the Centennial Light)! Not the answer you're looking for? Browse other questions tagged meaning meaning-in-context american-english or ask your own question. Can object complements make any difference to sentences? What does “in a sinister light” mean? Does 'for' here mean despite? and Does 'lightness' here mean light-minded? what does “sip sign green-light” mean? What does “light” mean here?